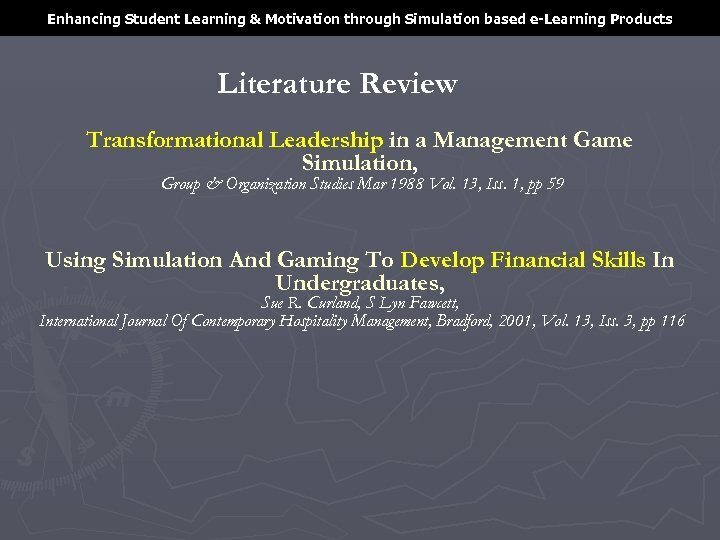 Enhancing Student Learning & Motivation through Simulation based e-Learning Products Literature Review Due to ever-increasing scope and scale of work in this area, formulating development standards are becoming important. 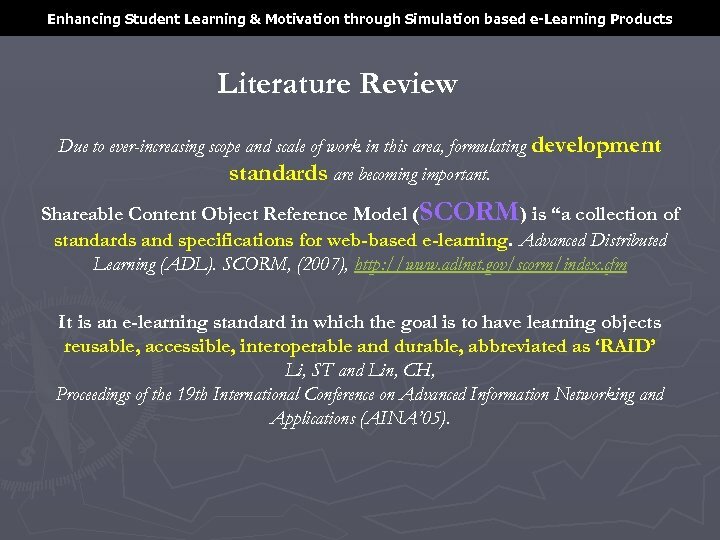 Shareable Content Object Reference Model (SCORM) is “a collection of standards and specifications for web-based e-learning. 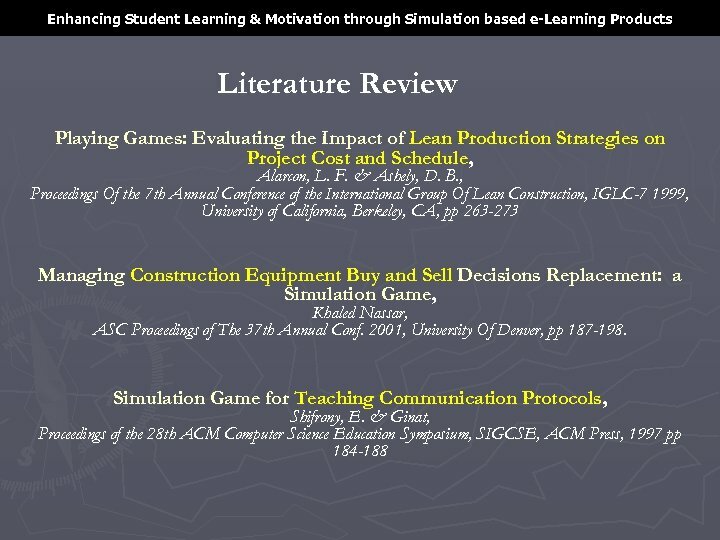 Advanced Distributed Learning (ADL). 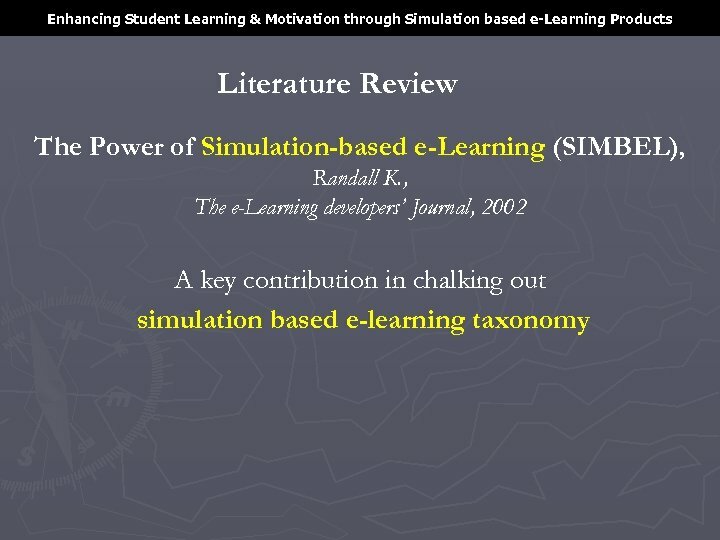 SCORM, (2007), http: //www. 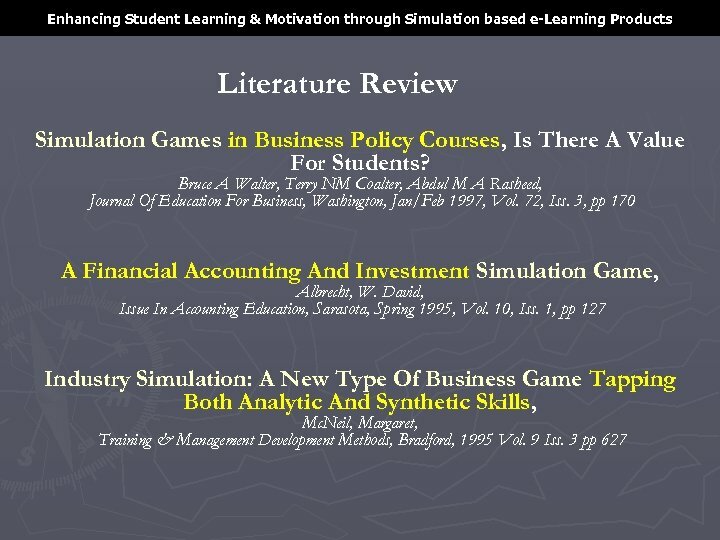 adlnet. 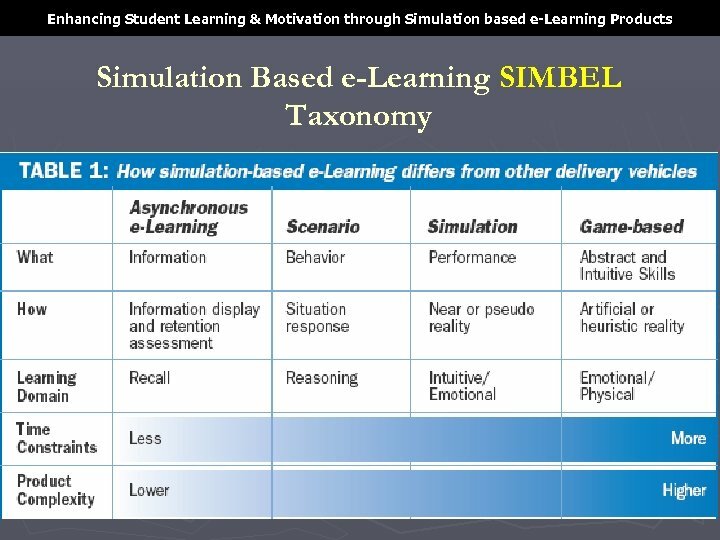 gov/scorm/index. 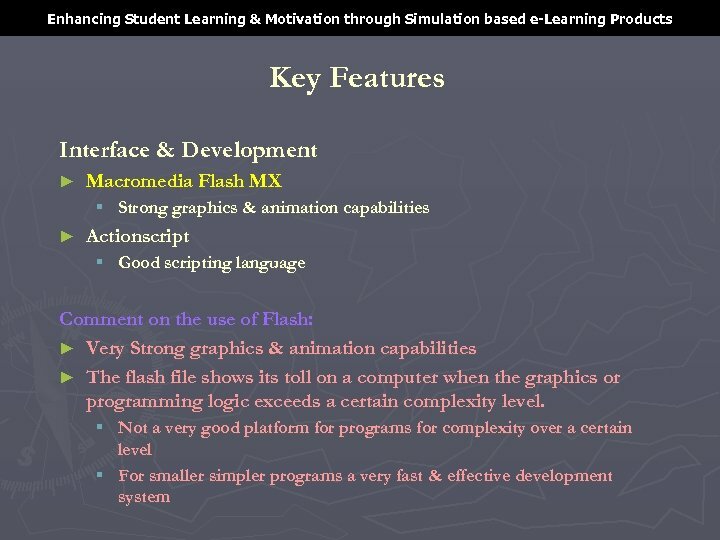 cfm It is an e-learning standard in which the goal is to have learning objects reusable, accessible, interoperable and durable, abbreviated as ‘RAID’ Li, ST and Lin, CH, Proceedings of the 19 th International Conference on Advanced Information Networking and Applications (AINA’ 05). 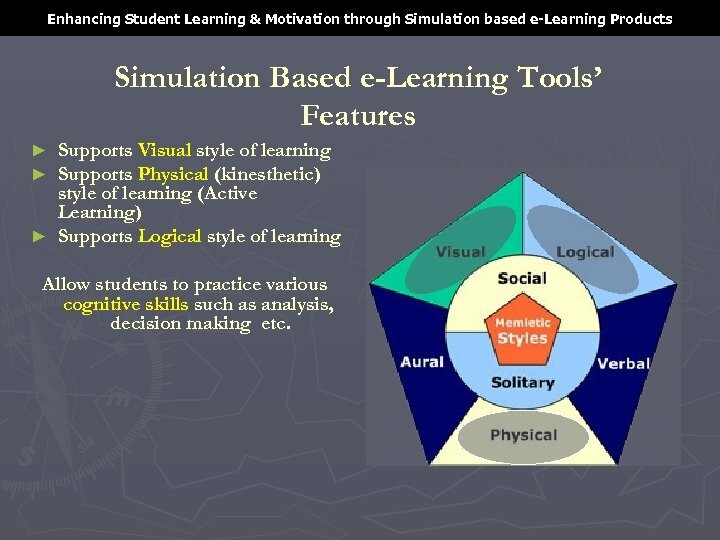 Enhancing Student Learning & Motivation through Simulation based e-Learning Products Simulation Based e-Learning Tools’ Features Supports Visual style of learning Supports Physical (kinesthetic) style of learning (Active Learning) ► Supports Logical style of learning ► ► Allow students to practice various cognitive skills such as analysis, decision making etc. 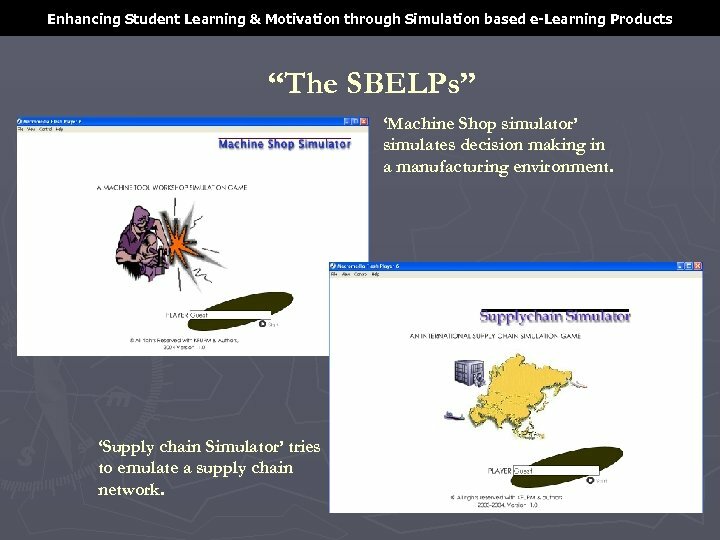 Enhancing Student Learning & Motivation through Simulation based e-Learning Products “The SBELPs” ‘Machine Shop simulator’ simulates decision making in a manufacturing environment. 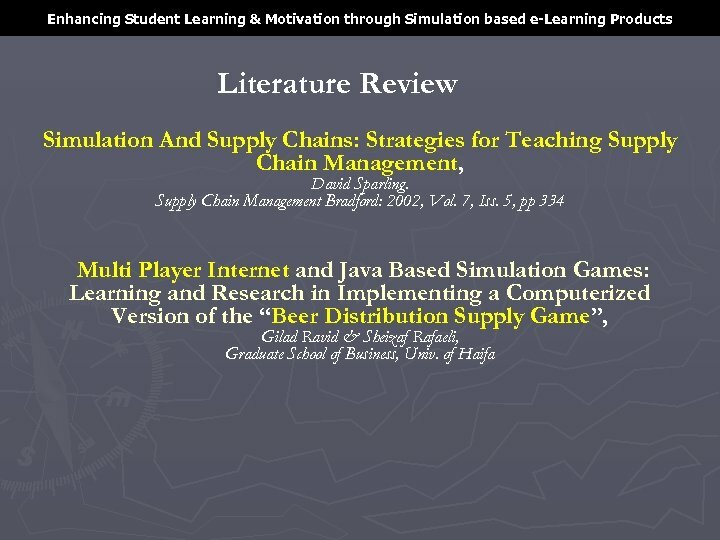 ‘Supply chain Simulator’ tries to emulate a supply chain network. 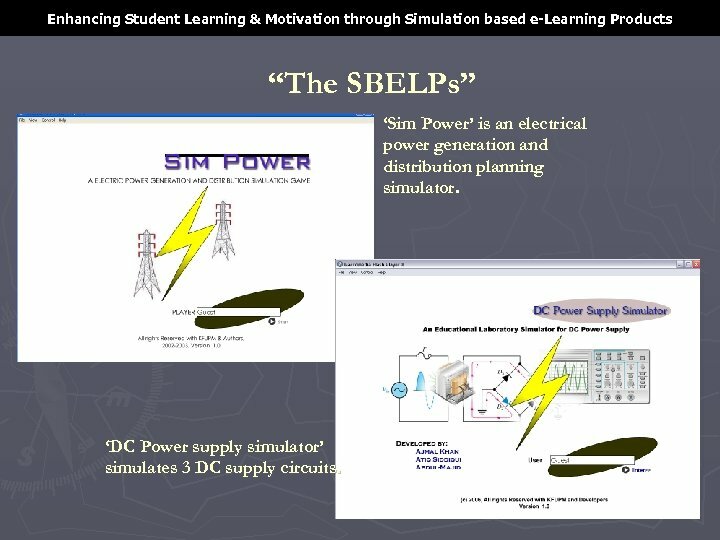 Enhancing Student Learning & Motivation through Simulation based e-Learning Products “The SBELPs” ‘Sim Power’ is an electrical power generation and distribution planning simulator. 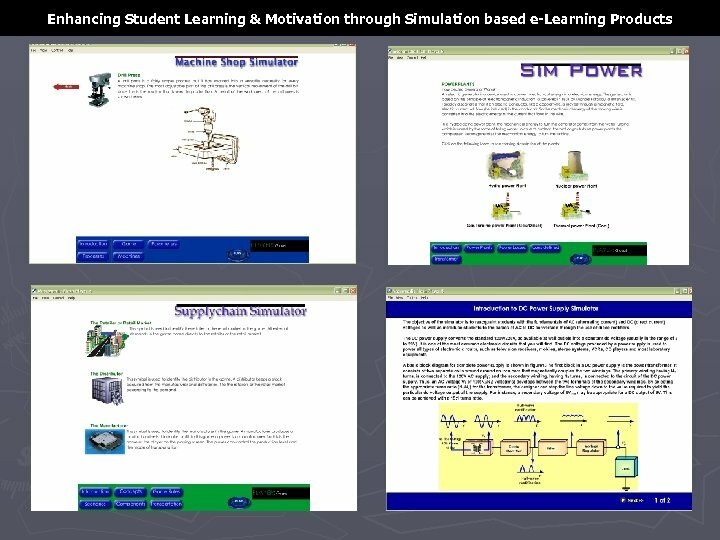 ‘DC Power supply simulator’ simulates 3 DC supply circuits. 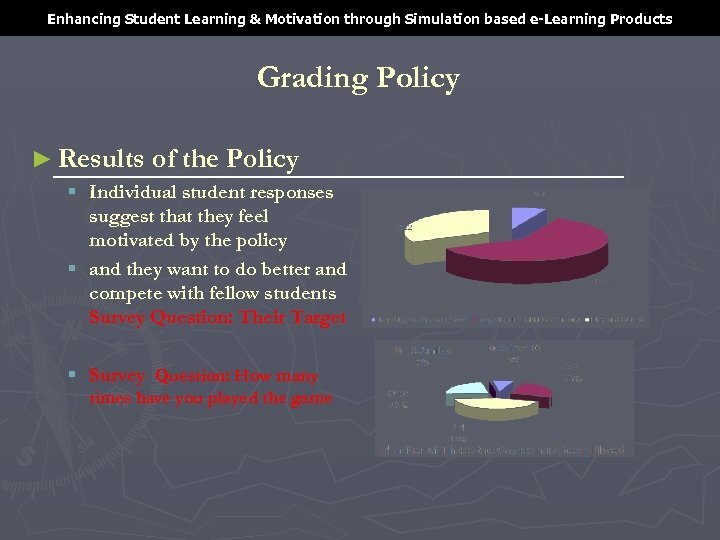 Enhancing Student Learning & Motivation through Simulation based e-Learning Products Grading Policy ► A policy of “attempt, target & improve” was adopted. 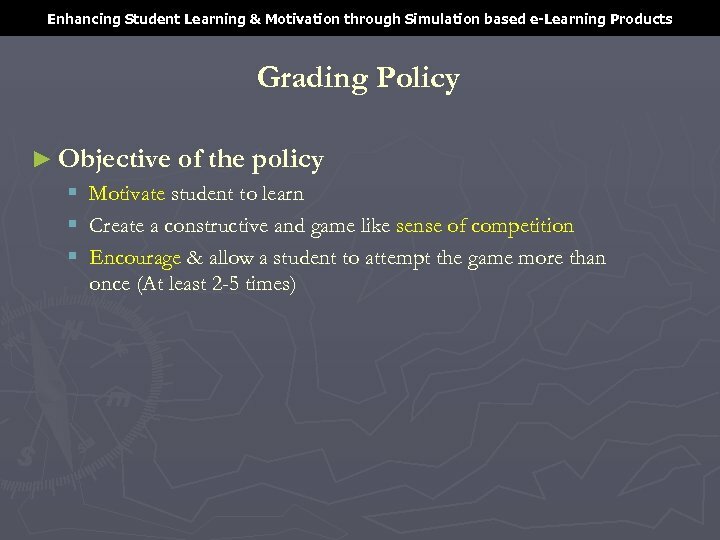 Features of this policy is as follows § Various primary performance/reward targets were set for each game. 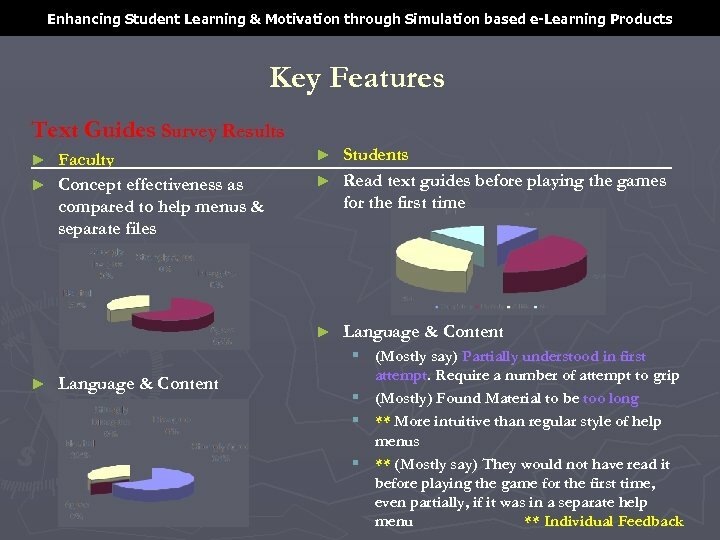 This is to set and achieve initial individual targets. 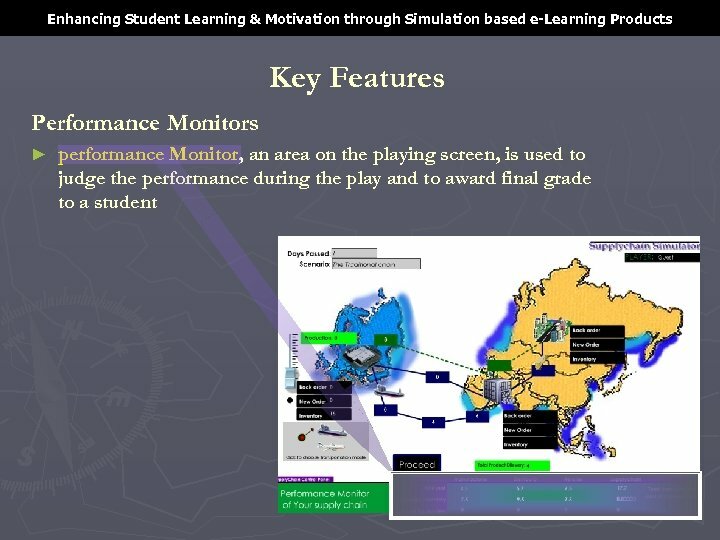 § The best performer in the class would get a special reward (Bonus). 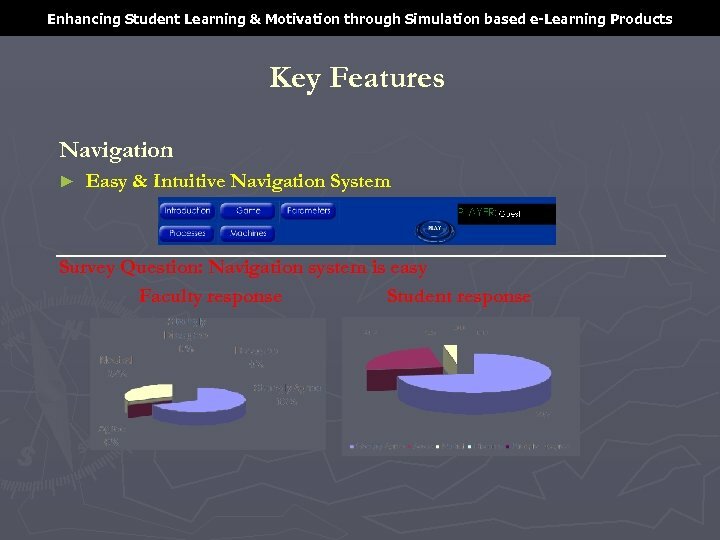 This is to create an environment of interclass competition. 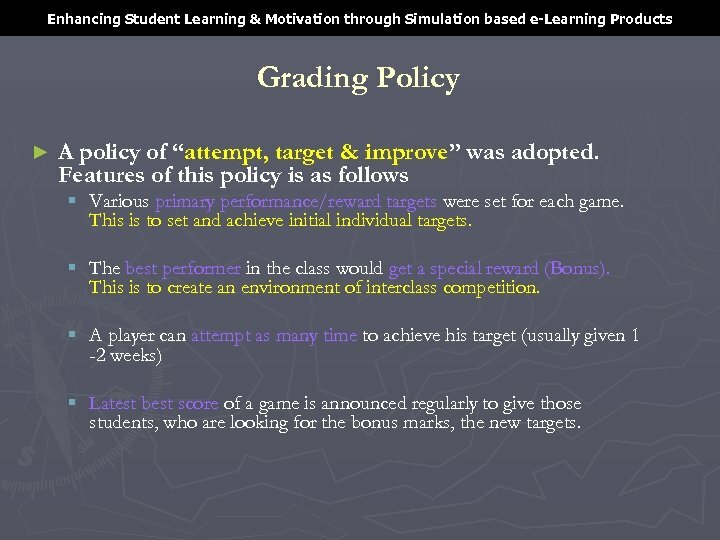 § A player can attempt as many time to achieve his target (usually given 1 -2 weeks) § Latest best score of a game is announced regularly to give those students, who are looking for the bonus marks, the new targets. 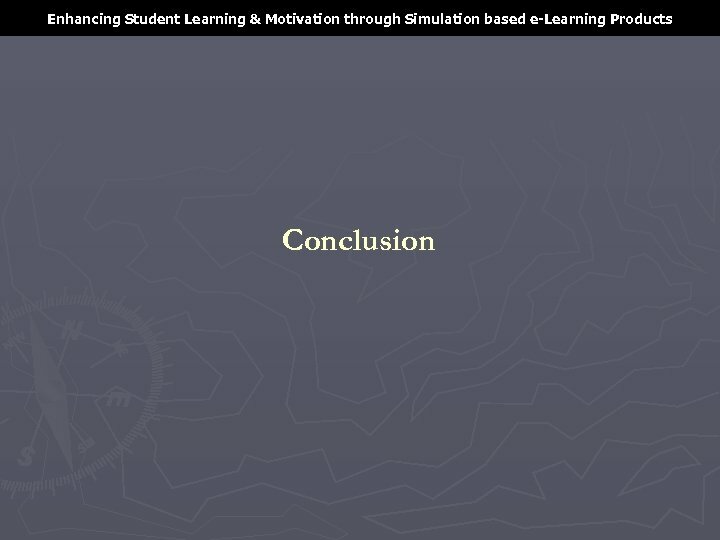 Enhancing Student Learning & Motivation through Simulation based e-Learning Products Summary & Lessons § The games were not explained (in detail) in the classrooms. 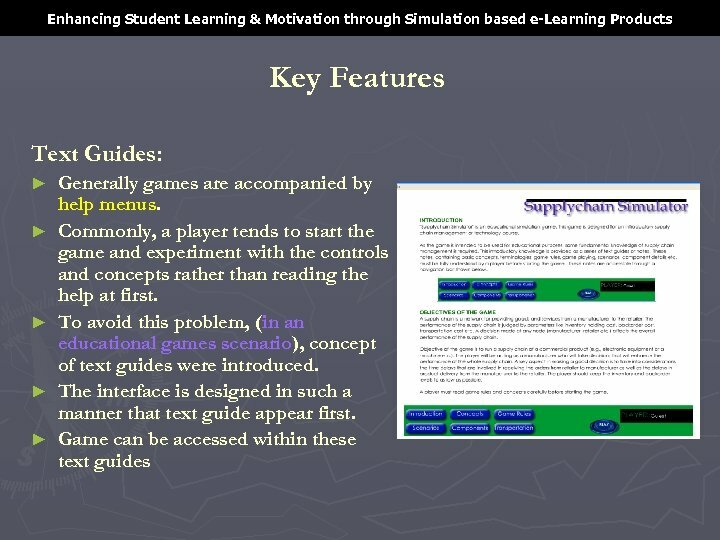 Students were asked to read, understand play the game on their own. 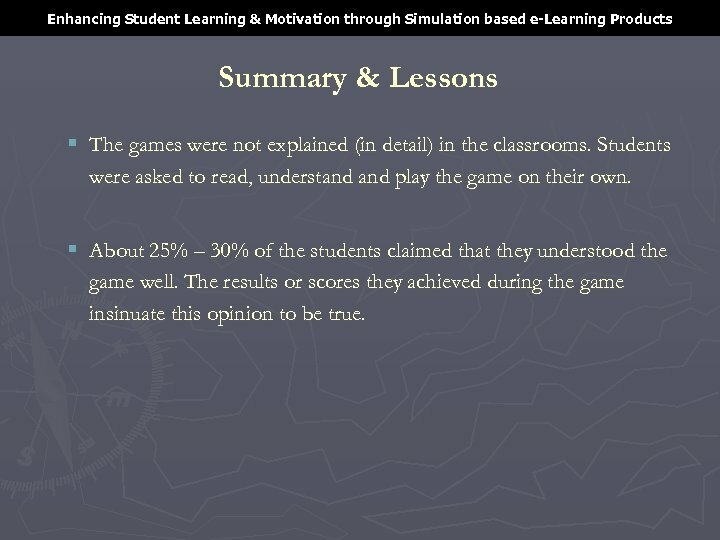 § About 25% – 30% of the students claimed that they understood the game well. 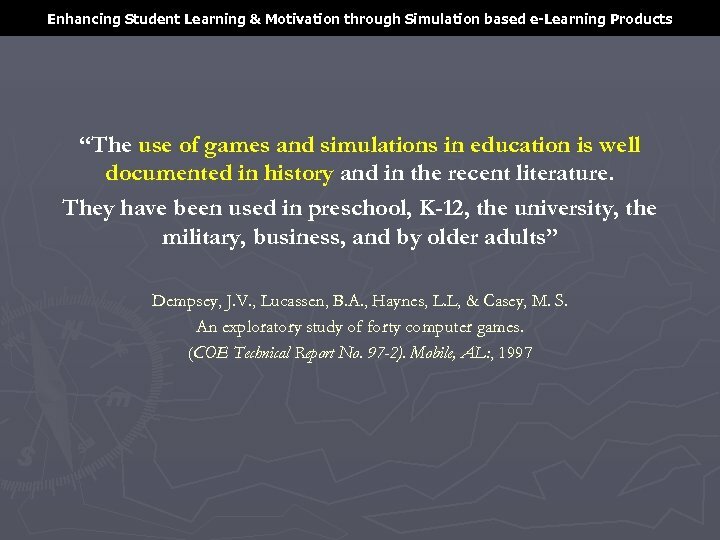 The results or scores they achieved during the game insinuate this opinion to be true. 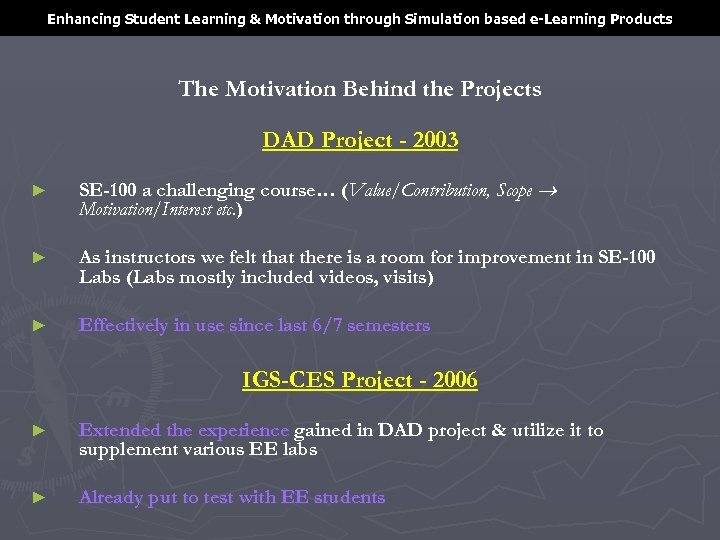 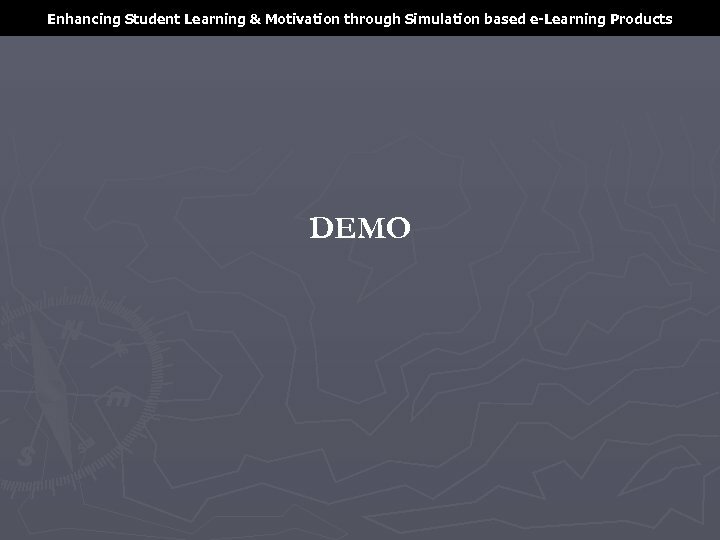 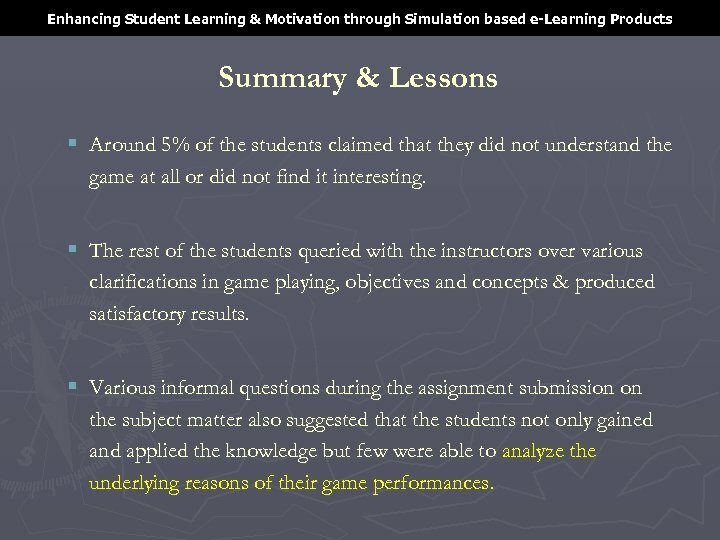 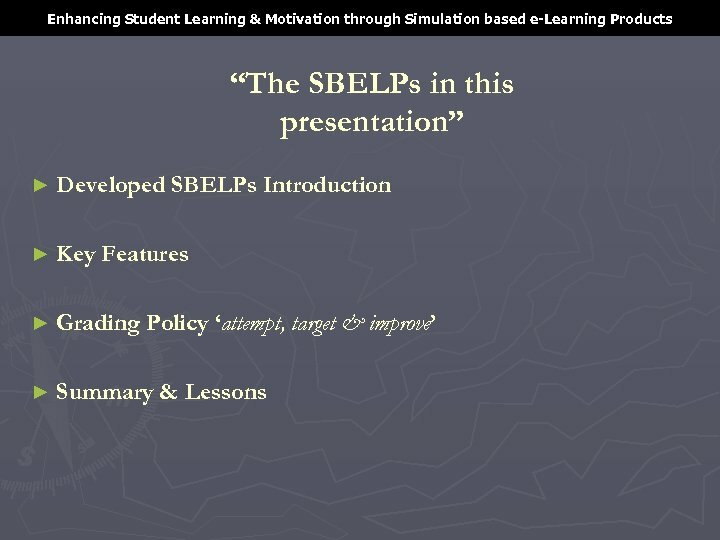 Enhancing Student Learning & Motivation through Simulation based e-Learning Products Summary & Lessons § Around 5% of the students claimed that they did not understand the game at all or did not find it interesting. 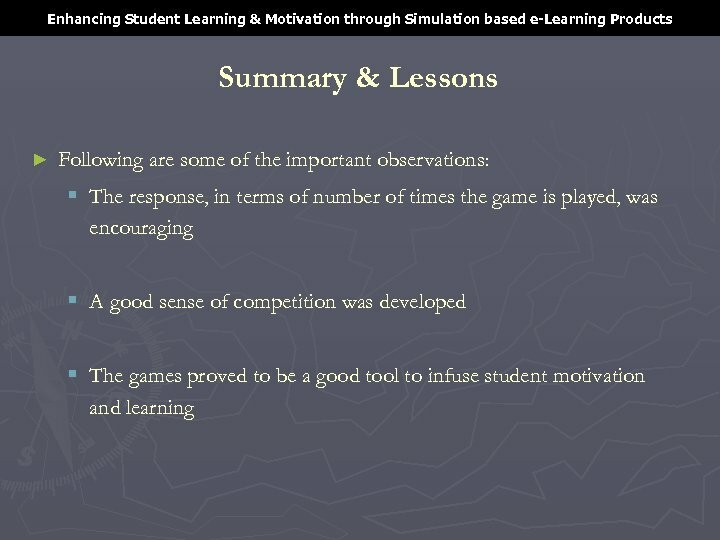 § The rest of the students queried with the instructors over various clarifications in game playing, objectives and concepts & produced satisfactory results. 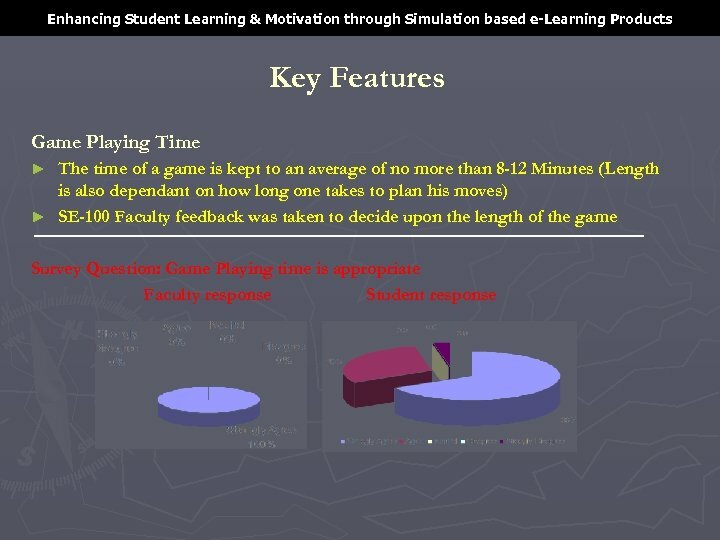 § Various informal questions during the assignment submission on the subject matter also suggested that the students not only gained and applied the knowledge but few were able to analyze the underlying reasons of their game performances. 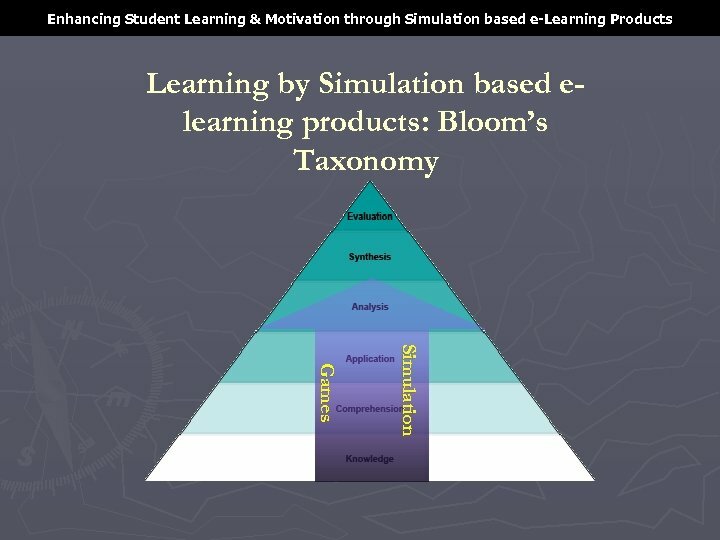 Enhancing Student Learning & Motivation through Simulation based e-Learning Products Extensions & Suggestion ► Multi-player § Team work, Multiple roles etc. 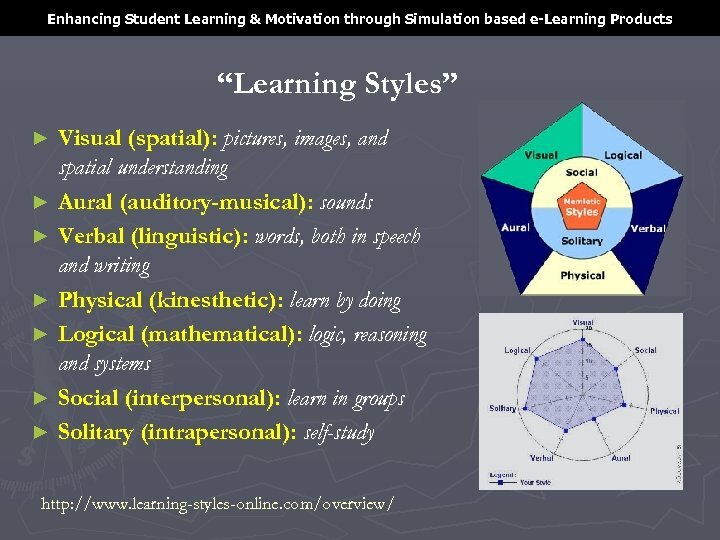 (Mainly for higher level) ► Higher level of decision making. 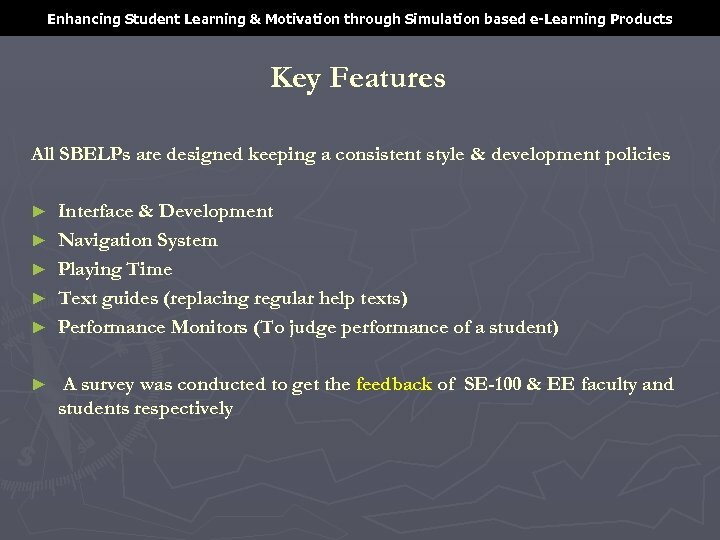 § More decision variables etc. 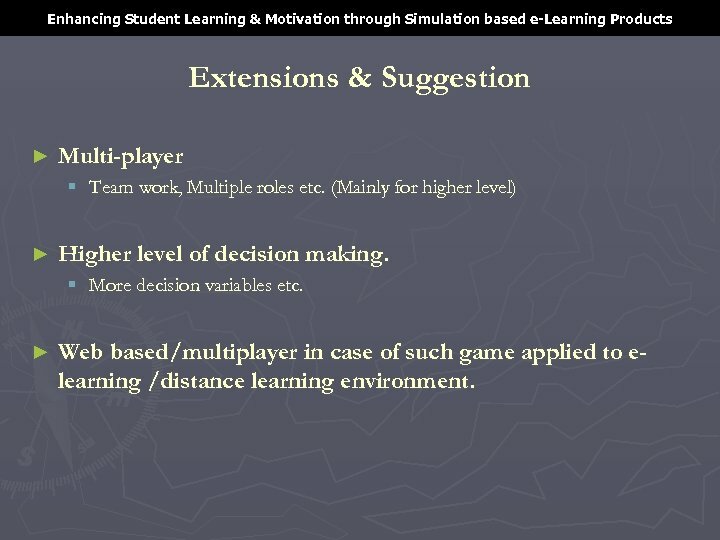 ► Web based/multiplayer in case of such game applied to elearning /distance learning environment.